Looking professional is not something you only do on the court. What about all those times you travel to play at some other team’s court? Or when you’re getting ready to warm up and all eyes are on you? 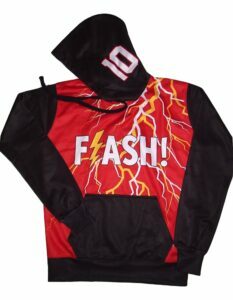 Getting custom-made basketball hoodies and basketball warmups is a sure-proof way of making your team stands out. Plus, your brand-new professional look will intimidate your rivals — even before you show your moves on the court. Our basketball team apparel is the perfect match between comfort and style — you don’t have to choose one or the other anymore. We use the best fabrics available so that you can feel comfortable during your travels. Our basketball hoodies are warm—you will never again feel the difference in temperature between the indoor court and the street. They’re also super soft, which means they won’t scratch or itch. On top of all this, you can fully customize your basketball team apparel. Choose one of our awesome designs and change the colors and logos to match your team. If you don’t like any of our many designs, we can also create something unique for you! We can make one from scratch based on your unique design at an affordable price. We carry all sizes from YXS to A5XL. All our basketball team apparel is made from a high-quality smooth-surface medium-weight polyester fleece. You can choose whether you want your basketball team apparel to have set-in sleeves or raglan-cute sleeves. Our apparel has a drawstring hood and a front pouch pocket for you to keep your belonging on the go. All team apparel options come with elastic cuff sleeves and bottoms. Traveling and warming up in style has never been easier. Even before your team puts on their sublimated basketball uniforms and gives their best on the court. Just picture your entire team wearing custom-made basketball hoodies on their way to their next game. No other team will have similar hoodies with your team colors, logos, and slogans. It’s the perfect opportunity to steal the spotlight from other teams and to shine bright.